Kathryn Schulz is an expert on being wrong. 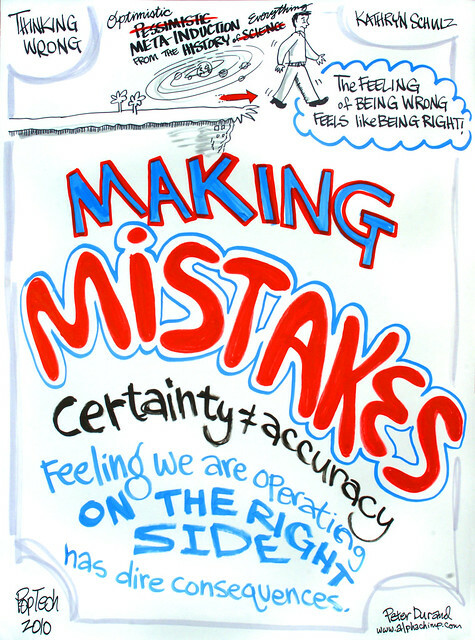 The journalist and author of Being Wrong: Adventures in the Margin of Error says we make mistakes all the time. The trouble is that often times being wrong feels like being right. What’s more, we’re usually wrong about what it even means to make mistakes—and how it can lead to better ideas. Although being wrong is the stuff of human nature, notes Schulz, we have a very difficult time accepting how often we make mistakes. This gap between perception and reality explains how things that really matter, from estimating the stability of our housing markets to the fidelity of our spouse, can go so wrong. “You might think it’s about a failure to look inward,” Schulz says. “I want to suggest that’s exactly backward. In fact, we spend a lot of time thinking about the accuracy of our perspectives.” According to Schulz, this deeper feeling of accuracy is incredibly seductive but it often fails to reveal what’s really going on.